AV: Tell me about the title of your latest album Moth in Flames and what that means to you? PE: The main idea I had when I came up with it was the sacrifice of the artist to the creative process. When someone becomes so deeply involved in their creation they are not really here anymore (For the time being, anyway!). Later, it occurred to me that there were other facets to it, It could be a metaphor for sexual union, or the ecological state of the planet. Those are my interpretations, anyway. In my opinion a good title is open ended. AV: When did you start work on this album and did you have any ideas in mind as to what direction that you wanted this project to go in? PE: I think it was about a year ago. I went through a few different variations. I would switch out pieces now and then until the flow was just right. I did have a general idea or inspiration. I remember when Private Music was a new label I had the impression that albums like Patrick O'Hearn's Ancient Dreams or Eddie Jobson's Theme Of Secrets were sort of extending the arc that Tangerine Dream were on right up until Baumann left. I feel with Stratosfear TD was starting to bring in more sophisticated elements tonally and harmonically than they had up to that point, but when Peter left the trajectory changed. I thought the sound became more mainstream and less visionary. (The very thing that defined TD, IMO) So with those early Private Music releases I heard a deeper harmonic musical vocabulary combined with delicious synth tones and vision. Going in that direction where I felt that "Spacemusic" could really evolve into an art form that could be taken seriously. So with this album I leaned more towards following that arc. Not in the sense of trying to "recreate" anything about those influences other than the way the music on those albums made me feel. AV: How have artists like Klaus Schulze or Tangerine Dream laid the foundations for the work you did on Moth in Flames? PE: Well they certainly are influential. Probably Klaus more than TD. With TD I rarely listen to anything beyond the Baumann years. What they brought to the table for me was the visionary qualities in the music. I came of age in the 70's and so to me the electronic music that appeals the most has a quality of internal visions, maybe a kind of meditative state, but definitely music as "painting with sound". Free flowing and impressionistic. While I am certainly influenced by their work I have spent a great deal of time forming my own voice within that genre. 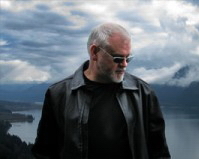 If I were to choose who I think are direct main influences I'd say: Peter Baumann, Steve Reich, Klaus Schulze, Manuel Gottsching, Patrick O'Hearn and Claude Debussy. But again, I've never tried to emulate any of them too closely without bringing something original to the table. Music is a continuum and everyone is standing on the shoulders of giants. Everyone builds on what came before. AV: One description I read of this album said that it blurred the boundary between melodic and ambient music. First how would you describe those two terms and secondly how does the music on Moth traverse the ground between them? PE: Hmmmm well, that's not how I would describe it. I do not necessarily see the two things as mutually exclusive, but having said that I do take the time to craft melodies I think fit without distracting from the mood. If I were to describe what is unique about my music it would be more the harmonic side of things. I spend a lot of time crafting the chords underneath the melody, which is kind of invisible. But it's the contrast of harmony underneath that can bring feelings to a melody. The trick with this music is making an environment that sets a mood but is always slowly changing and adding details to find on repeated listenings without jarring the flow. AV: When you are composing do you purposely set out in one direction or the other when it comes to melodic vs. ambient music? PE: That is difficult to answer, because with each piece I try to change the way I approach it just a little bit every time. Of course, every musician has their sonic fingerprints, but I try to throw myself curve balls in a Zen-like fashion to change the way I do things. Sometimes I will impose a certain set of limitations while I'm making a piece so that I have to find a different solution to a musical "problem" and that tricks me out of some of the gestures I naturally fall into, but then at other times I start writing with no ideas at all on how things will go and I just try to get to a state of deep listening.... letting the music suggest where it goes next. 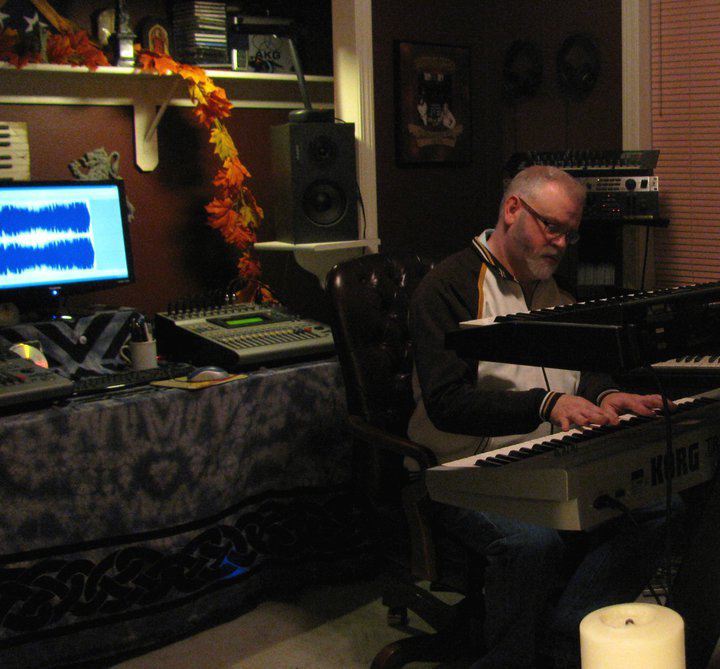 When I'm composing I often hear the music internally, like when you hit a note on a guitar and the other strings begin resonating, I will hear other parts in my head that go along with what I'm playing and I try to catch them before they disappear. AV: Bert Strolenberg said in his review of Moth that sounds were created from scratch and 0 presets were used. Explain to me what that means and then talk to me about how much more effort was required of you as composer to create these sounds from scratch. PE: Well that's true for the synth sounds. There are some sounds on there like Piano, Rhodes or Mellotron that obviously I didn't create, but it's true that I usually create a pile of synth sounds before starting a piece. And that will sometimes determine where the music goes. Sometimes the sounds are tailored after the piece has started, too. That was always the thing that attracted me to synths in the first place, this creating your own sound aspect... with a guitar, piano, trumpet or any other acoustic instrument there are tonal "tricks" you can do to alter the sound, but essentially they will always sound like a guitar, piano or trumpet. I suppose a synth will always sound like a synth, too at some level (to get semantic about it!) but the horizon became much larger for a "sound" to be less fixed. More fluid, where it can even change radically -as- you're playing it. Probably more so than other instruments. This was a very early appeal for me. Also the art of synthesizers and sequencers tend to be more like animation. There is a craft and an art to creating it, but a different approach than what you would find than with someone acting in a film. AV: There are 10 tracks on Moth in Flames that you crafted for this release. Do you think of the project as a whole when it comes to the individual tracks on an album and how each track continues the mood of the previous track? In other words do you think of how track one leads to track two and how the flow of the album will be affected if you use one composition as opposed to another composition? PE: Sure. I mentioned that this album went through a few permutations until it got to the point I was happy with it. It started with two pieces, then the rearranging and tailoring as each new piece arrived. I will almost always have a work in progress CDR in the car and will change the ordering and sometimes I'll throw out entire pieces. A couple pieces on this album I left off, not because I thought there was anything wrong with them individually, but they just didn't fit the overall mood and flow. I have one songwriter friend who says "I just keep writing songs and throwing them on a pile until I notice some of them starting to form gangs". That's a great way of describing how some of my albums have come together. 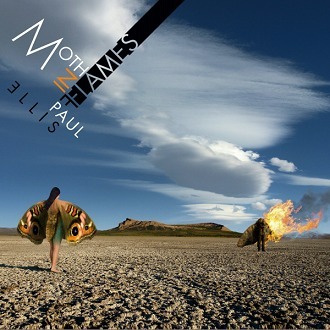 AV: Artists are always moving and evolving within their musical compositions so tell me what you see in Moth in Flames that speaks to what is evolving and changing about Paul Ellis and his approach to music and how those changes show up in the compositions of this album. PE: Economy of movement, maybe. I suppose "less is more" is something that correlates between the two. I don't spend much time thinking about that side of thing. I recently had an older track of mine: "Shining" pop up on the iPod and I was surprised at how many layers I had built up for it. Recently, I have been thinking that will be my move for the next album is to return to more intensely layered counterpoint sequencing. I do usually change an aspect between albums, like on "I Am Here" I really stretched out and let the pieces be very long. For Moth In Flames I reigned it in more and the pieces were more concise. I just recently finished a track for Chuck Van Zyl and another change I can see coming up in my next album related to this piece is that I wrote it in 10/8 time with 3/8 and 30/8 loops phasing over it. I think the next album I will explore these polyrhythmic possibilities more. On a certain level I am not sure how to answer the question because I cannot be objective about my art. It's like asking me to look at my own eyes without using some kind of mirror. I don't consciously add aspects of my life to the music, but obviously it -is- in there. Going back to the concept for this album of the artist sacrificing / moth burning I usually become so involved in the creation of an album that my life becomes the background and the music becomes the foreground. AV: What do you find interesting or compelling when you compose tracks that lean towards the “Berlin school” style of electronic music? Are there certain feelings and emotions that are easier to nail in this style of composing? PE: It's the feelings and emotions that you can get out of syncopated counterpoint sequences that is exactly the attraction for me to writing in this style. To some people it seems to be a cold genre, but it's not. It takes deep listening to understand it. Compared to many genres it is a distant, outside kind of music. (Which is another attraction for me.) It would seem to someone whose ears are tuned to emotions in music being expressed with, say, the sound of a blues guitar player bending a note, which is in comparison a much more sensitively tuned sound because the fingers are directly touching the strings which are creating the sound as opposed to synths where there is no direct contact in the generation of sound. So there is this built in distant quality to the music, that is true, but I find all kinds of emotions are there even in the most abstract soundscapes... it's just in adjusting the listening mode. In some ways this genre has always seemed to me to be the closest we ever got to a "Classical" approach of creating music. Berlin School is very influenced by the Minimalist school, but also, going back to the feelings this music has, I also hear a kind of Baroque influence. There's a kind of mathematical, geometrical quality to the patterns in the music common to both of those styles. I lean towards using the sequencer as the rhythmic element. There are drums in a few of my pieces, but mostly I like the sound of unfolding interlocking sequencer patterns... that's all the rhythm I need. Having said that I'm a big fan of Harald Grosskopf. 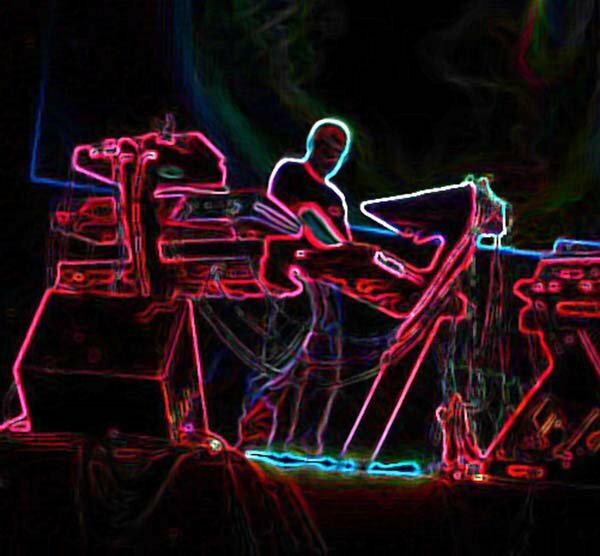 He and Michael Shrieve are the best the genre ever got to fitting drums and percussion into the electronic sound worlds of EM. AV: When you are in the midst of composing, recording, mixing a project like this do you ever really consider it work or is it something else? PE: It is work and it is also play and a meditative state and it is cheaper than psychotherapy. It is actually the most important reason for my existence. AV: What were your feelings in regards to what you were hearing from your speakers as you moved through the process of making Moth in Flames? PE: It started off being an even more open and airy mix, as in less parts, but I was encouraged by a friend to add some more layers. At first I resisted and I felt it was fine as is, and I think it would have been fine that way too, but what happened was after he said that I kept hearing other parts when I would listen back to it. And that was my gut instinct was telling me it wasn't finished. If I am sure something is ready I won't be influenced by outside opinions, but when I hear it myself, then I listen to advice. What I aim to feel when the music plays back is a kind of subtle shaded ecstasy in the music. AV: Not asking you to pick a favorite song but as you look at the tracks you’ve assembled for Moth in Flames which track presented you with the greatest challenge of realizing and which one or two songs most exemplifies the overall mood and style of this project. PE: Hardest one to realize? "She Walks In Beauty" would be a contender. There is a lot more going on in there than it might seem. Lot of pads and drifting sounds constantly, slowly morphing. Hundreds of different sounds making up one sound just in the background chords alone. Pablo Magne, who is the graphic artist who did the beautiful albums cover helped out on that track. I think I would single out the first three tracks as being unique and a good representation of what is different on this album than my others. I mentioned earlier that the Private Music era was an inspiration. On this album I tried to keep that blend of phasing analog magic with the cleaner, sharper edges of digital precision. A Minimalism, Baroque and Berlin School mix. AV: Any other thoughts you’d like to share about the music, the creation of or the finished project of Moth in Flames? PE: I have mentioned that those early Private Music releases were sort of a guiding light on the direction of the music on this album, but also... the name "Private Music" itself says exactly how I've always felt this music functions best. This is personal music, not designed for parties or loud celebrations. There is plenty of music available for that. This music is more directed for internal delights, it creates an atmosphere that allows a kind of mental breathing space. At least that was the goal. I hope you all enjoy it! AV: Thank you for all the excellent insights into Moth in Flames. It has been awhile since we spoke but it is always a pleasure to hear your views on the music and I'm sure the readers of Ambient Visions will appreciate your views as well. Appreciate you taking the time out to talk to me again. Wishing you much success with Moth in Flames with many more albums to come in the years ahead.